KRAKOW under NAZI OCCUPATION 1939 – 1945 Oscar Schindler’s Enamel Factory – The best exhibition in Krakow! 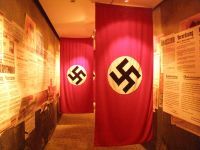 The permanent exhibition titled Krakow under Nazi Occupation 1939 – 1945 opened at Oscar Schindler’s Enamel Factory – the new branch of the Historical Museum of the City of Krakow situated at Lipowa 4; is primarily a story about the city and its inhabitants, both Polish and Jewish. It is also a story about Nazi Germans – the occupiers who arrived here on 6 September 1939, brutally disrupting Krakow’s centuries-long history of Polish-Jewish relations. This new exhibition has been created with the use of various means that go beyond the framework of traditional museum exhibitions, such as theatricalization of exhibition space, elements of stage design, multimedia solutions, etc. Krakow’s past has been recreated here in an evocative way in order to give visitors an opportunity to experience history in a direct, almost tangible way. Tickets: 19PLN/adult, 16PLN/kids, students, seniors.